Terry: I am hard of hearing and use lipspeakers from time to time. How do I know who to book? Lesley: Very good question. Every person’s needs are different. You explained to me that you are new to using lipspeakers and that you find some signs being used added to the meaning and that you also found that in turn, this meant the lipreading was less tiring. You would benefit from using lipspeakers who can sign. Terry: Why do we have two associations and how are they different? Lesley: There was a growing need to separate lipspeakers who can sign from those who can’t. Lipspeakers would arrive for a booking where lipspeaking with sign was required and they didn’t have the necessary skills to support the deaf person. This meant the deaf person was left without support, the lipspeaker was often left feeling upset or disappointed that the right questions had not been asked at the time of booking to ensure the right support professional had been booked and public money was wasted on having to rebook the correct professional. The impact on a deaf person is huge. Imagine going to an interview for a job. You’ve booked a lipspeaker with sign but the agency hasn’t requested such. A professional lipspeaker turns up but they can’t sign. You can’t continue with the interview. The prospective employer doesn’t understand why the support was incorrect. The interview can’t go ahead. All sorts of ramifications. The new directory will make it clearer and easier for deaf people who specifically need a lipspeaker who can use signs to support meaning to book the right support; the support professional that best matches their needs. Of course lipspeakers who satisfy the criteria can be members of both associations. Lesley: In short, I did. With a great of help and support from many lipspeakers and one in particular; Linzi, my daughter but also a qualified lipspeaker who has British Sign Language (BSL) Level 3 qualifications. I was the former Chair, Vice-Chair, treasurer and a long standing committee member for the ALS (The Association of Lipspeakers) and have over 15 years of committee experience including being the ladies representative at board level for my local rugby club and former registrant member of the NRCPD board. This made me confident of not only the need for change, but that I was able to start the association from scratch, make it a professional association that meaningfully supported lipspeakers and deaf people. Terry: What happened to the ALS? Lesley: The ALS is now over twenty years old and well established. Indeed, I was Chair from 2013-2016 and made many improvements. For example, I introduced internet banking, a new dynamic website, an established social media presence, 3 opportunities a year to obtain continued professional development (CPD) points for learning and development and saved the association spending out precious funds on travelling to meetings by introducing committee meetings through Skype. After successfully completing my Chairmanwomanship I soon saw that the incoming Chair had a different way of working and I no longer felt able to support the ALS. Terry: So the ALAS was all your idea? Lesley: No. The Association of Lipspeakers with Additional Sign (ALAS) was created as a response to the communication needs of deaf people. A response to the growing demand for communication support in English, with signs borrowed from the complex British Sign Language. Deaf people are relying more and more on a service that on paper doesn’t exist. Terry: Is Signed lipspeaking new or has it been around for sometime? Lesley: Sign supported lipspeaking is nothing new. It’s recognising in a more formal way a service that will hopefully give rise to a national occupational standard (NOS) and a future qualification to set a standard. This qualification will be based on vocabulary competence rather than on BSL linguistics and will be something to measure against to protect the user and registrant. I was part of the team that created the NOS for the new lipspeaking qualification so feel well placed to take this forward to realisation. Terry: How do I know what level of lipspeaker to book? Lesley: You should only book NRCPD registered level 3 lipspeakers who carry a badge. A lipspeaker with level one BSL would be hard pushed to say they can offer lipspeaking with sign support (unless the topic was dates, times and countries) but those who have completed level 2 and are working towards level 3 are capable of providing a service as their knowledge of BSL vocabulary is far better. Some deaf people, however, will require sign competence of level 6. This is easy to identify on the directory and each lipspeaker must declare their BSL skill level; some lipspeakers like me are also trainee (TSLI) and qualified BSL interpreters (RSLI). This differs from sign supported English (SSE) as interpreters aren’t trained in lipspeaking. A clear lip pattern is essential, hence lipspeaking with sign support comes under the remit of the professional lipspeaker and not an interpreter. Terry: How do you ensure members are kept up to date, professionally? 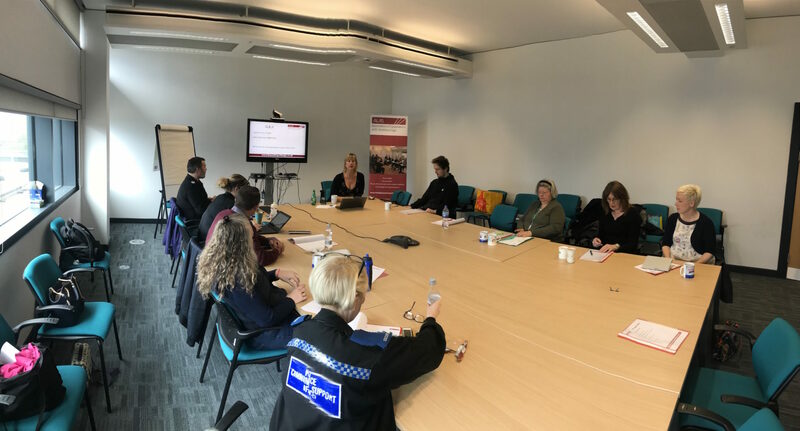 providing a minimum of 2 CPD opportunities annually for all members and these have included improving sign language vocabulary for lipspeakers and improving knowledge of public sector bodied such as the police. The training is open to deaf and hearing people. Please do check the website for details.